There was a time when a yacht cruise meant cutting all communications with shore but with the advent of satellite networks and modern electronics, you can enjoy all the luxuries of a charter getaway and yet remain closely in touch with work. One of the most common drawbacks of a charter for many potential clients is that they cant spend that much time out of contact with their office. In the modern world, being away from the office is one thing, but being unavailable by phone or email is impossible. The good news is that the modern charter yacht has better communication and work facilities than most homes (and even a few businesses!). Thats also the bad news for those who want to unplug from civilization, but you dont have to be in touch, either! Many experienced charterers plan some time each day to keep in touch even though they are on a luxury vacation, and charter yachts are equipped for just that need. That same satellite link (satcom) also gives you full access to the Internet and email, so you can check on stocks, review contracts, send instructions to employees, and deal with clients from far at sea. Many charter yachts implement the capability for business time even on vacation with fully-equipped work areas. Some have a dedicated office located in the master stateroom so you are away from distractions, while others tuck an office desk into one corner of the salon or skylounge so that, even though youre hard at work, you still have a wonderful view. 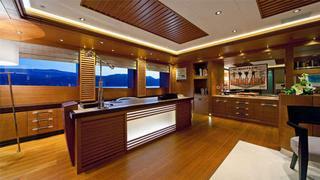 Charter yachts often have better communication and work facilities than most homes and even a few businesses! Either way, these desks are set up for full computer connectivity so you can bring your laptop aboard and have full access. In some cases, the yacht will have a dedicated computer available for the use of guests if you dont want to bring your laptop. The office area may also be equipped with a printer and fax but, if not, they will be certainly be available elsewhere on the yacht. With wi-fi becoming common on most yachts, you arent restricted to working just in the office area, and youll have full computer and Internet access with your laptop from anywhere aboard: a sunpad on the upper deck, a comfortable chair in the salon, or even propped up in bed. Cellphone coverage is usually good when youre in a harbor or close to shore, but the modern GSM (Global System for Mobile communications) systems on many yachts allow you to use your cellphone at all times. This permits you to make private calls without having to rely on a fixed phone in a public area of the yacht, and it also gives you access to your mobile phone address book. Those receiving your calls will also be able to recognize the caller ID of your cell phone. In essence, you can send and receive cellphone calls as if you were on land. For those who want to see their clients or employees as they talk to them by phone, voice-over-internet protocols such as Skype allow video conferencing and some yachts are specifically equipped with large screen monitors for video conferences and presentations.